(Vancouver, B.C.) Janet McLachlan, of West Vancouver, B.C., has become the first Paralympian to be named a finalist for the Sport BC Athlete of the Year Awards in the senior female athlete category. 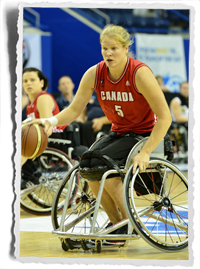 McLachlan earned the honour for leading the Canadian women’s wheelchair basketball team to gold on home soil at the 2014 Women’s World Wheelchair Basketball Championship. Before she sustained a career-ending knee injury, McLachlan was a high-ranking basketball and rugby player. She won two national championships with the University of Victoria Vikes and represented Canada at the 2001 Beijing Student Games. In 2006, McLachlan tried wheelchair basketball and fell in love with the sport. She made the national team in 2008 and has quickly risen to become one of the world’s best female athletes. This past June, McLachlan played a commanding role in the sixth-ranked Canadian women’s national team’s gold-medal performance at the 2014 Women’s World Wheelchair Basketball Championship in Toronto. Not only did she score a double-double in every game and lead the tournament in rebounds, but she also scored the game-winning shot in the semifinals against the third ranked Dutch team with just 0.9 seconds left on the clock. For her efforts, she was named to the tournament all-star team. The Sport BC Athlete of the Year Awards ceremony will take place on March 12, 2015. For more information, please visit www.sportbc.com.